Can’t Sleep? You may have Insomnia. Insomnia is a common sleep problem for adults, according to the National Sleep Foundation, affecting about 30 percent of Americans today. In a recent survey, more than half of all people said they have had experienced at least one symptom of insomnia within the previous year. About ten percent have trouble functioning during the day due to acute insomnia. Doctors define insomnia as difficulty falling asleep or staying asleep, even when the individual has the opportunity to sleep. Without sleep, a person is likely to experience fatigue, low energy, difficulty concentrating and mood swings. Performance at work or school usually suffers too. Acute insomnia may last for a night or two. Acute insomnia may be the result of stress, pain, or emotional excitement or turmoil. Chronic insomnia may last for weeks, months, or even years and may be the result of long-term physical or psychiatric problems. In many cases, it is impossible to know the source of insomnia. 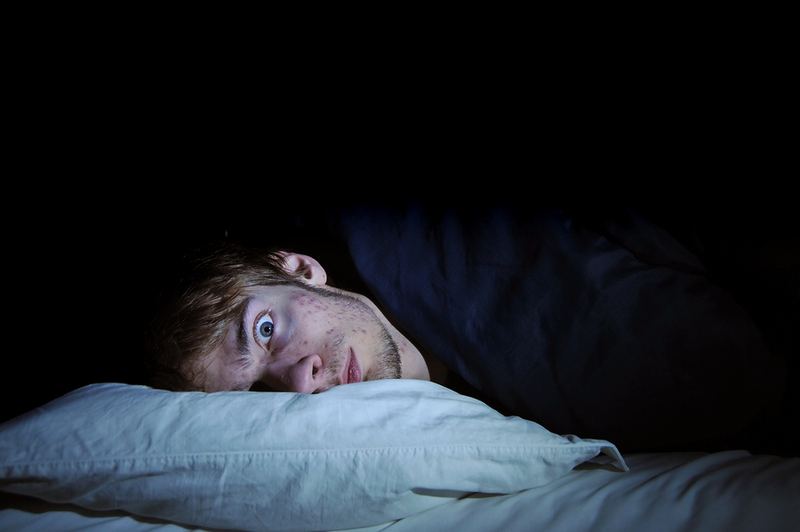 While insomnia is common, everyone experiences insomnia in a slightly different way. Some people have trouble falling asleep while others cannot seem to stay asleep, for example. Treatment for insomnia varies greatly too, from person to person and even from night to night. A hot bath might work wonders one night but an open window might do the trick the next night. People who suffer insomnia usually develop an arsenal of tricks that help them fall asleep and stay asleep night after night. Establish a bedtime routine that acts as a signal to your body that it is time to go to sleep. Lay out your clothes for the next day, for example, or make the morning coffee and lock the doors. Repeating this routine each night tells your mind and body that it is bedtime. Speaking of coffee, curtail your caffeine intake and stop drinking caffeine altogether by noon. Caffeine suppresses the brain’s urge to sleep. Avoid coffee, tea, chocolate and other foods and beverages containing stimulants. Nicotine is also a stimulant that revs up your heart and perks up your brain. Do not watch television before bed, as it can stimulate brain activity. Try relaxing music instead. Baths can help you fall asleep faster and stay asleep all night. Standard soaking tubs work well, as do whirlpools and air baths. For best results, try a bathtub featuring a music therapy system, aromatherapy, or chromatherapy. These advanced features provide the ultimate in relaxation. Your body starts to cool down a couple of hours before you go to bed and continues its cool down until about 4 am or 5 am. This cooling action makes you sleepy – the sharper the cooling action, the sleepier you feel. Taking a warm bath about 90 minutes before bedtime will help you sleep. The hot water boosts your body temperature, which then makes for a more drastic, and therefore more relaxing, cool down. Warm water also relaxes your muscles to melt away stress and anxiety. Whirlpools, air tubs, and soaking tubs optimize the soothing action of warm water. Do not let insomnia keep you up again tonight. Relax, take a bath and sleep well tonight.